with the benefits of perfect health. This is in the natural area of Port Barton, Palawan, Philippines, where many people still build their own houses and whatever needed, from Nature. Having a healthy body and mind makes life and doing things much easier in this world. Establishing that foundation of health and maintaining it is the base of this retreat. This process does not require advanced poses nor ‘challenging’ yoga. The classes for learning this are the first part of each day. Living in nature requires a dwelling place, so learning the basic skills for building one comes next. Using natural materials and developing the ability to use a hammer and saw you learn how to build a hut, bungalow or house from the wood and bamboo that is growing around, while using a limited amount of cement. This is the main house on the Palawan property, you can see the solar panels on the roof. A power system is the next step, plugging into the sun for electricity and learning how to store the day’s energy in batteries. This is complemented with the installation of inverters to be able to have lights, music, kitchen appliances and power tools. There is a diesel generator used as a backup for rainy days, or more like rainy weeks, but this is seldom required since this style of living utilizes mindfulness to conserve energy and the local weather brings sunshine pretty much every day, even if there are showers. 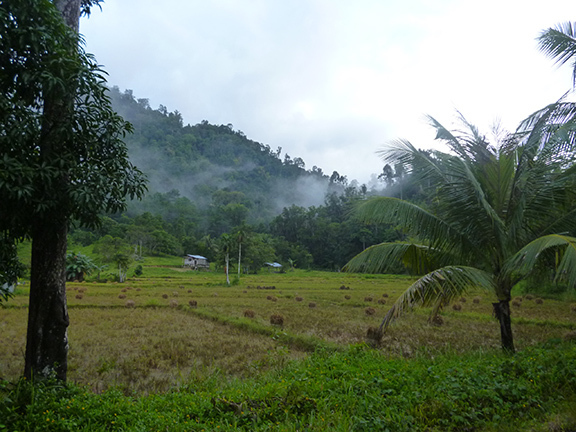 There are a lot of rice fields around Port Barton, since most of the locals still grow their own. Food comes next as a daily requirement. From the fruit trees already planted, we gather the ripe fruit and prepare a meal, or just eat it. Then we learn to employ bio-dynamic methods of soil build up and how to plant vegetables. This can develop into permaculture. techniques. In the picture at the left you see a typical native house and yard full of plants. It is easy to grow most things on this island. The next picture with the tent by the mango grove is from one of our happy campers during a yoga teacher training, the roof and floor to the left is a hut. The third picture shows the original native house we built on the land, with two floors, a deck and an kitchen. Such a dwelling might cost about $2000 to build. The one on the far right was Zara's hut by the creek, which served her well during her training. This retreat takes place on the island of Palawan in the Philippines at the Chakra Yoga Center, which is already set up as an example of this lifestyle. Off the grid and fully solar, the property has over a dozen buildings ranging in complexity from simple huts to a six room house. Some of the smaller buildings are constructed with clay bricks made from the local (on site) soil. It is a residential program with limited space (5 huts) but tenting is a comfortable way to be on the land. Many students in the past have enjoyed being so close to mother nature. The first ones to register can choose the huts. The other option is to stay in the village and do the 25 minute walk each way each day. Cost of the retreat with food included is $2500 USD. For those who can truly relate to the lifestyle there is the option to lease a piece of the property, build your own cabin and have this as a home for a few years. More info on the program starting March 11 please fill out a form or send us a message through our facebook page.